Today I received my Father's Day present from my wife and boys. 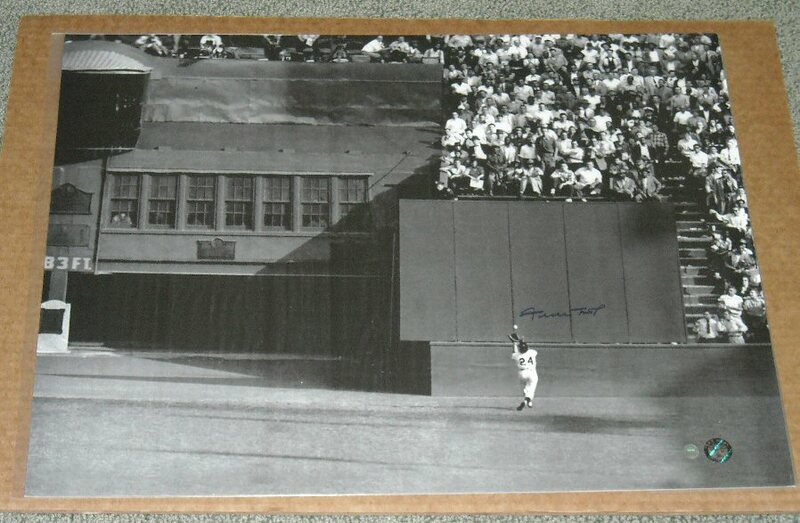 They got me a 16x20 signed Willie Mays picture of "The Catch" from Steiner. I'm running out of wall space but I'd like to get this framed and hang it on the wall in my basement. I've already described the day, so I'll just show the items I got signed here. 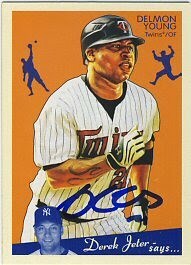 I really like the 2010 Topps Heritage set and tried to get as many of those as I could, which turned out to be three. 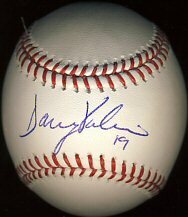 I had Danny Valencia sign a ball on the sweet spot. 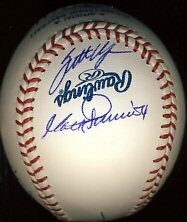 Finally, since John Castino was signing with Harmon Killebrew (and I got an item signed by Killebrew for my son), I had Castino sign a ball for me. 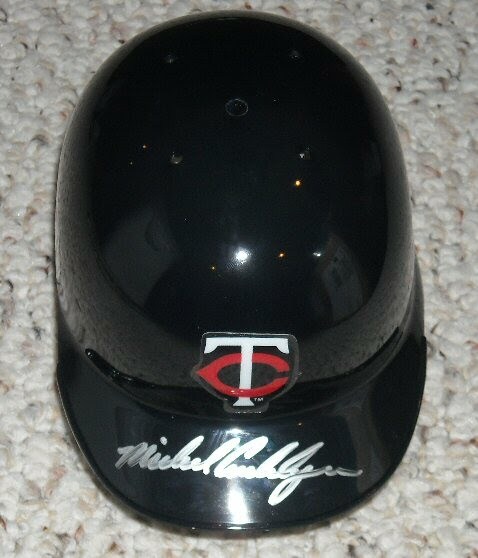 He was kind enough to offer to add his Rookie of the Year inscription, which I gladly accepted. I would say Mr. Castino was the friendliest of the day, right up there with Killebrew, and he thanked us for coming out and supporting the event. Very nice. I think this ball is the most pleasant surprise of the day, and I'm happy to have it in my collection. Yesterday was a long day but my younger son and I had fun. We got there plenty early, and had we been gambling men, we probably would have gotten Joe Mauer's autograph. We saw a line that looked short enough to get through, but was obviously set up for a long line. 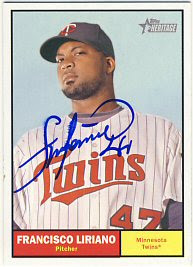 We knew it would be Mauer, Morneau or Thome. But, we didn't want to take the risk so we decided to be first in line for an unknown group of players. Being first in line was pretty fun for my son, and luckily Denard Span was at our station, who is my son's favorite player. David already has autographs from him on a game used bat, mini helmet, an 8x10 picture, a baseball and a couple of baseball cards, so he got him to sign a mini bat. 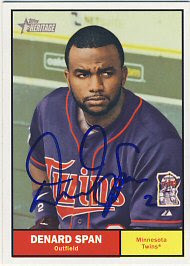 Had he known we'd be seeing Span, he probably would have bought a cap for him to sign. 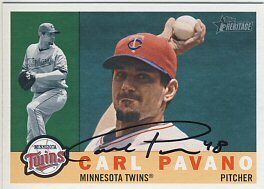 Also in that line were Pavano and Harris. Since we were first in line, Harris asked me how long we'd been waiting. He seemed surprised to hear that we'd been there three hours already. 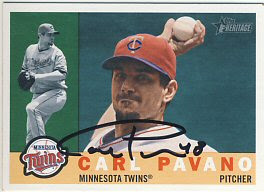 David had Pavano and Harris sign cards. 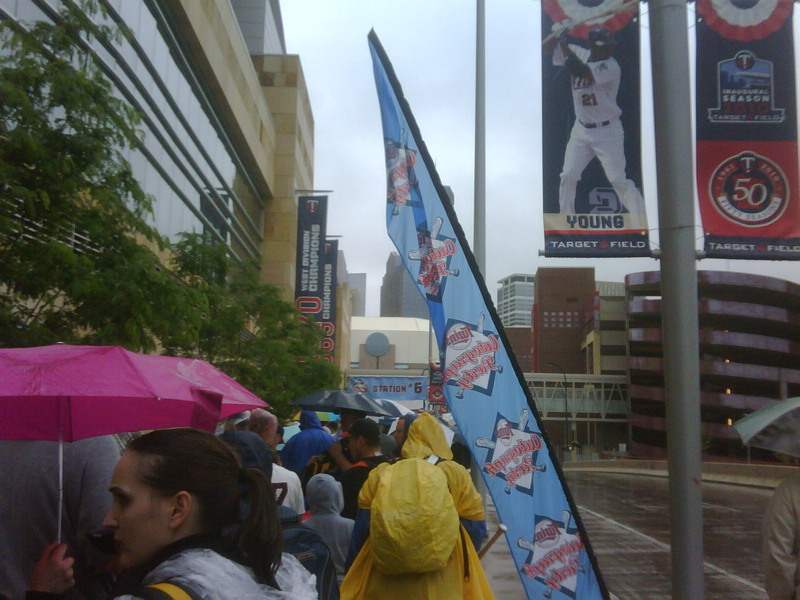 At this point it was raining so we ducked into an opening into Target Field that they were using to allow people to use the restrooms. We used this shelter to put our recently signed items away and get out the items for the next signing, which was Liriano, Steve Liddle and Danny Valencia. David had Liriano sign a 2010 Topps Heritage (which got a little smudged), added Steve Liddle to his 2010 team ball, and had Valencia sign a ball, which he signed on the side panel (and it got a little smudged). Again, we ducked into our shelter area to put these items away and get ready for the next station we wanted to target, which was Slowey, Young and Plouffe. David had all three sign cards. This line was a bit longer and took us about 30 minutes to get through. 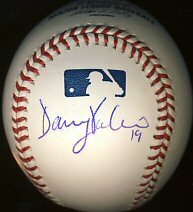 Time was winding down a bit for the current players to sign, so we decided we'd head over to station #6 where Killebrew was scheduled to sign at 2:00. We got in line and there weren't too many people in front of us, so we were confident we'd get through. 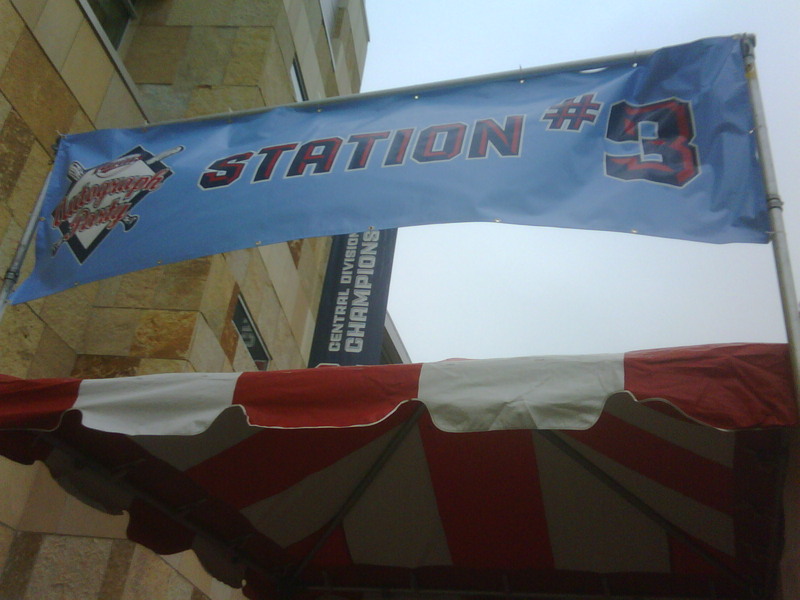 With about 15 minutes left, we realized that the line was very short for the current players at our station, which included Cuddyer, another of David's favorites. 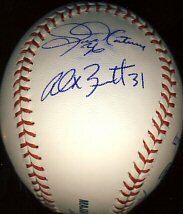 So David ran up and got Cuddyer to sign a mini helmet, and added Scott Ullger and Alex Burnett to his team ball, while I held our place in line for Killebrew. We managed to put these items away while standing in Killebrew's line, under our umbrella. It started raining quite a bit harder at this point. 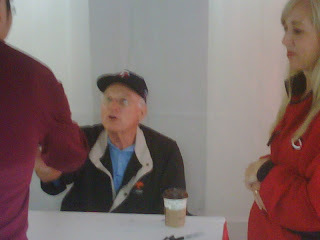 We waited a half hour until Killebrew started signing at 2:00. At 2:20, our line had barely moved! We were getting nervous that we might not make it through. 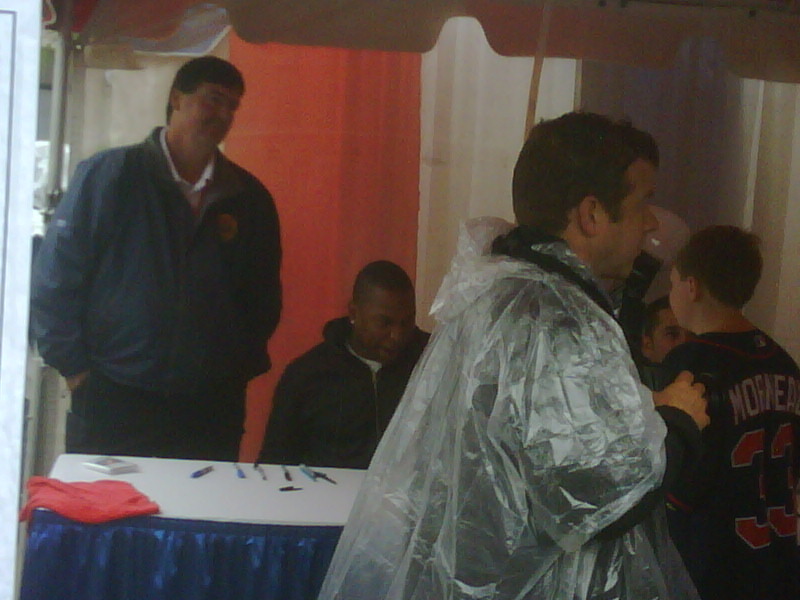 The rain obviously slowed things down as people couldn't get their pictures, baseballs, etc out and ready to be signed until they got under the tent, otherwise the rain would have gotten them wet. 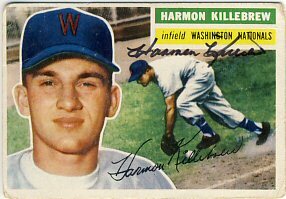 Also, Mr. Killebrew is a notoriously slow signer. 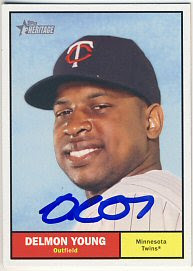 He's very friendly and is careful to sign neatly. 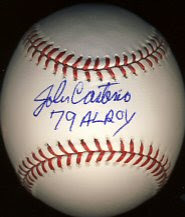 John Castino was also signing with Killebrew. 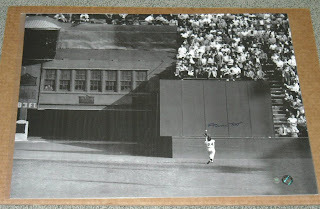 Killebrew and Castino discussed the1956 Topps David was having Killebrew sign. Killebrew seemed to enjoy seeing it. At about 2:45, the ushers started counting people in line, presumably to cut off the line at some point. They counted well beyond my son and I so we felt confident we'd make it. The rain let up a bit, and the line seemed to speed up. We got done with about 20 minutes left in the session. My son and I got a bobblehead as well as the 1956 Topps signed for my other son. 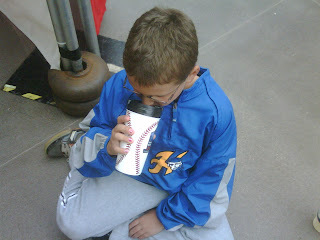 Killebrew is his favorite player, and he couldn't make it because he was playing in a baseball tournament (in the rain). He's a catcher, and by the end of the third game that day, he was sitting in several inches of water behind the plate. We had to hose off his equipment when he got home. Anyway, he was happy to get these items signed. My younger son also had John Castino sign a mini bat for his brother. It looked like we might have had a chance to get through Carew's line, but we were pretty tired and our feet were cold and wet, so we decided not to risk it. It was a relief to sit down once we got on the train, then we headed to a restaurant for some pop and appetizers. A pretty exhausting day, not quite as exhausting as TwinsFest, but the rain added some additional stress and discomfort. I enjoyed spending the day with my younger son, which we don't get the chance to do very often. Later today or this week I'll post the items that I got signed. We got through Killebrew's line with about 20 minutes left. We're on the train back home, hoping to dry off and get something to eat. At least for now. Killebrew just started signing but the line has hardly budged. 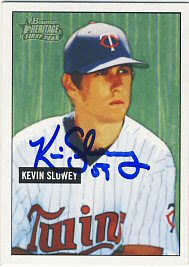 We just got through the line with Slowey, Plouffe and Young. Now we're waiting for Killebrew. He starts signing at 2:00. We're about 50 people back, so getting Killebrew shouldn't be a problem. John Castino is also signing with him. About 15 minutes before the signings were to start, the rain began. Not too heavy, but heavy enough to make it very difficult to keep our baseballs, pictured and cards dry. They have tents set up for the players, but they're small and only a few people fit under them. So far, we got Span, Harris and Pavano. 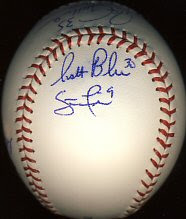 Then Steve Liddle, Danny Valencia and Liriano. 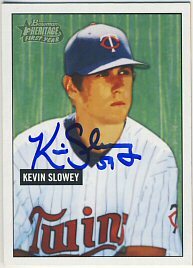 Now we're in line for Slowey, Young and Plouffe. The current players start signing in one hour. After this line, we plan on going to station 5 with Liriano and Danny Valencia as well as Steve Liddle. Then if there's time, we'll try Cuddyer, or whatever one we think we can get through. For the retired players, we plan on trying to get Killebrew on a couple of things for my older son, who is playing in a tournament and can't be here. My son bought some hot chocolate to try to stay warm. We now have the schedule. We picked a pretty decent line. 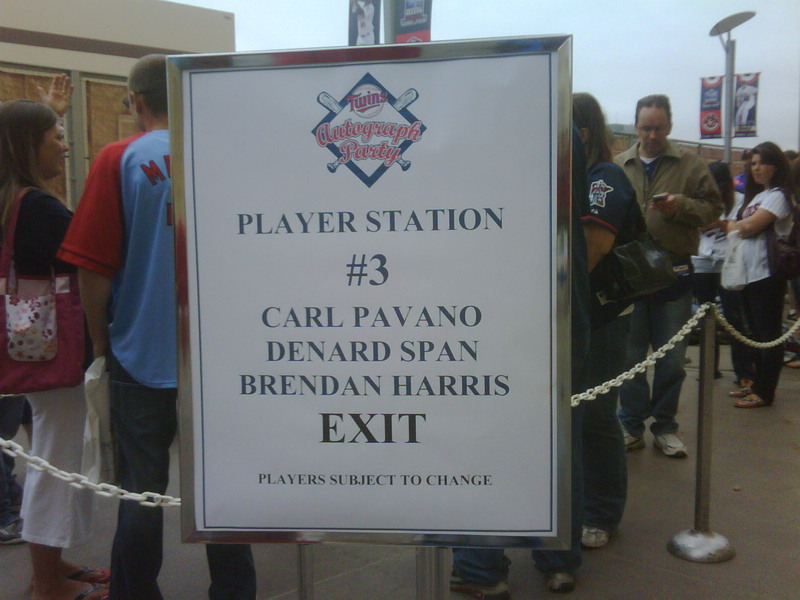 Carl Pavano, Denard Span, and Brendan Harris. Now we just have a three hour wait! 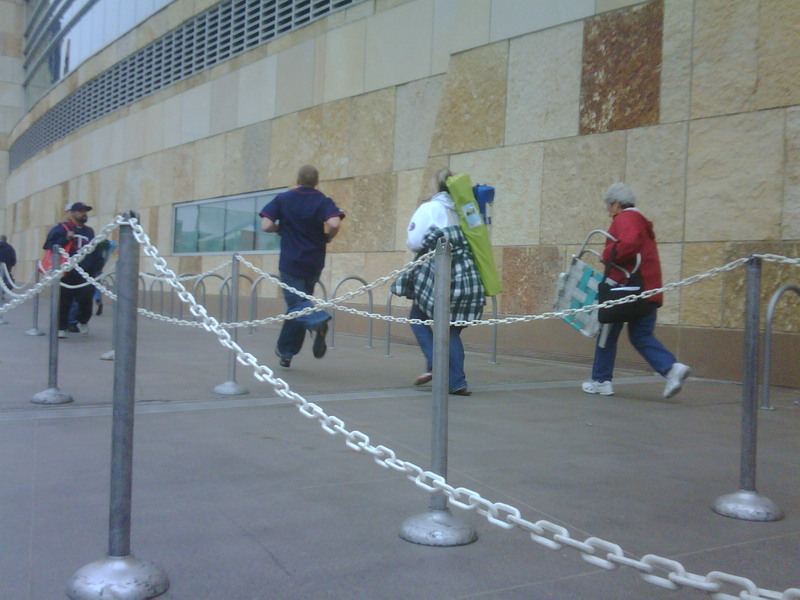 People are running past our station. They must have found out where the players are signing and had made an unfortunate guess as to which line to get in. No one is running to our line though! We have arrived at the Twins Autograph Party. There are a few stations with REALLY long lines and several stations with nobody in them. We chose to be first in line at one of the smaller stations. 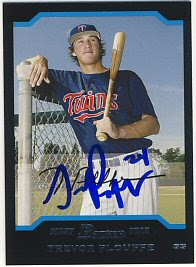 Hopefully we'll get a couple guys like Baker and Punto, and then have time for one or two more lines. It's a little cold, about 58 degrees. Cloudy and threatening to rain. 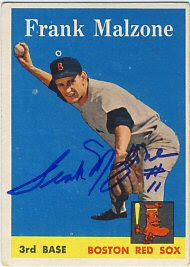 My son has received a few 1958 Topps back for his set recently. 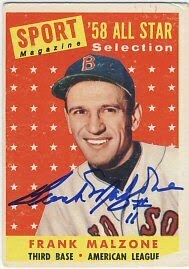 Yesterday he received two cards from Frank Malzone, both his normal card as well as his All Star card. Today, he received a card back from Gus Zernial, which he sent out nearly three months ago. On Tuesday, I received a card I sent in to another Chris Potter signing. 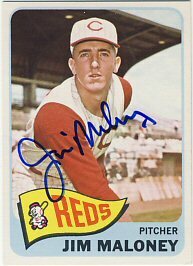 Chris had arranged a signing with Jim Maloney, who signed a 1965 Topps for my set. 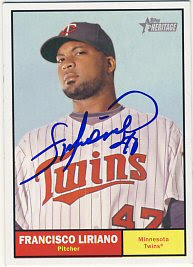 I think this brings my total to 348 signed cards for that year. 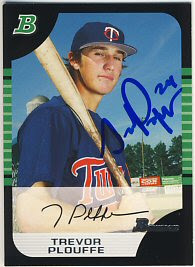 Today I received a card that I had sent in to a J. Paul Sports signing. 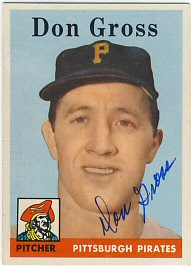 This signing had a lot of players from the 1960 Pirates team. 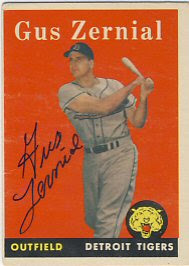 I sent in a 1958 Topps to be signed by Don Gross. It has been a while since I added another card to this set. This is number 346 for my set. I was surprised to realize that I have more in my '65 set than my '58 set, since I've been working on the '58's much longer.